"Rich always told people we first met at the beach, which was true -- sort of. Actually we met through the on-line personals," said Dique (pronounced "Dickie") LaPenta in an interview in her Eureka home last week. 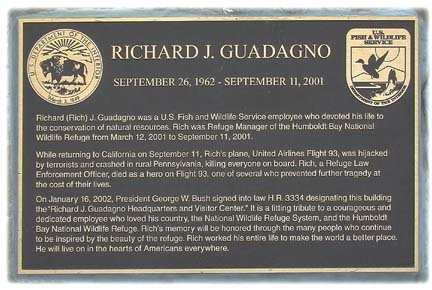 Richard J. Guadagno -- always "Rich," even to those he supervised as manager of the Humboldt Bay National Wildlife Refuge --posted his photo on an Internet Web site in March 2000. His message said simply that he wanted to meet new friends when he moved to Humboldt County and if something else came of it, so be it. Oh, and he had a great Frisbee dog. The photo showed a man in his late-30s with dark curly hair and a shy smile, stepping over stones in a river. His black German Shepherd, Raven, was at his heels. He was clad in runner's leggings against the cool weather and wore the fleece vest of an outdoor enthusiast. "That photo said a lot," LaPenta recalled. E-mails progressed to phone calls and phone calls led to a first date in mid-April. Meet you at Clam Beach. Bring your dog. "If the dogs weren't compatible, the whole thing was off," LaPenta said with a laugh. Photo: Richard J. Guadagno with Raven, and Dique LaPenta, with Aiki. So began a love affair that ended 17 months later on Sept. 11, 2001. Guadagno, who really didn't like to travel all that much, was returning to California from New Jersey where he had been celebrating his grandmother's 100th birthday. Shortly after breakfast was served on Flight 93 out of Newark four hijackers took control of the plane, herding the passengers into the back and leaving them unguarded. (All other planes had five hijackers each.) Although Guadagno did not have a cell phone, other passengers did. They began making frantic calls and soon learned planes had been flown into the World Trade Center in New York and the Pentagon outside Washington. "Evidently a vote was taken -- true to American tradition," LaPenta said, then added quietly: "It must have passed." According to flight data recordings, investigators know the cockpit was breached as some passengers attempted to overcome the terrorists. Guadagno's federal law enforcement credentials and badge "and other forensic evidence" recovered near the cockpit confirm what his fiancé already knew --he was one of the heroes of Flight 93. "Rich had a combination of gentleness and strength. He was a very calm person, a little reserved -- shy even. But he had a presence of authority. People listened." LaPenta said his former co-workers in Oregon tell a story about Rich out for a jog on a wildlife refuge there. When he encountered some hunters shooting out signs, "He confronted them -- he arrested them -- without even a badge or any ID [or a firearm]," she said. "He was just wearing his running shorts. "Rich was the type that when he saw what was happening [on the plane], what could happen, he wouldn't have needed a vote to burst into the cockpit, especially with a threat to women and children." Guadagno left a lot of dreams unfinished. Professionally he led a staff of six --at the refuge headquarters in Loleta and two assigned to Lanphere Christensen Dunes --an effort to upgrade and restore 3,000 acres of fish and wildlife habitat. He oversaw construction of a new headquarters and visitors center but did not live to see it dedicated. The complex was completed this spring and named in his honor. And then there are the billboards on a sliver of refuge land between Highway 101 and the bay just north of Eureka. "He wanted those billboards gone," LaPenta said. Just months before his death Guadagno wrote billboard giant Viacom and gave the company a deadline of 60 days to remove the illegal signs, an order the company continues to resist. Guadagno's personal plans were to be married to the woman he met on-line although no date had been set. They had settled into a comfortable routine of spending their time together either at her house, a neat stucco bungalow filled with antiques near downtown Eureka, or his, an A-frame in the Loleta woods that he landscaped with native plants. "Ever since that first date, we saw each other every day except when we were traveling," LaPenta said. "We talked all the time about growing old and gray together." 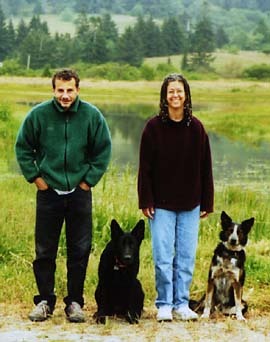 And together always included Guadagno's Raven, the German shepherd, and LaPenta's border collie cross, Aiki. LaPenta said she heard about the first two planes hitting the World Trade Center by the time she arrived that morning at College of the Redwoods where she teaches biology. She went on to her first class while a co-worker listened to news reports. When she returned she learned about the Newark flight and she immediately called Rich's parents in New Jersey. "Rich's father just said, `It doesn't look good.'" What followed was a blur. LaPenta's co-workers gathered around, her housemate came to take her home, phone calls from national media were refused. One good friend came by to take both dogs out for a run, a practice that continues to this day. Friends and family "made it possible for me to keep breathing." Some months later LaPenta was on a plane herself back to New Jersey for a memorial service that she barely remembers except for one fact: Rich's parents buried his few physical remains along with some of his favorite things -- including a few pounds of pasta. "He was a good cook. He loved to cook pasta," she said. LaPenta, who returned to teaching this spring after a leave of absence, said the Sept. 11 anniversary next week will be particularly hard. She plans to spend time with friends in Oregon out in the wilderness that she and Rich loved. Raven and Aiki will be along, too. "Now I tell people I'm a single mom with two dogs." The plaque at the Humboldt Bay National Wildlife Refuge Headquarters in Loleta. Remembering Richard J. Guadagno WHY DO THEY HATE US? A persistent question TOLERANCE OR PATRIOTISM? North Coast travel businesses CIVIL LIBERTIES AT RISK?